The year 2014 has been significant in terms of the falling unemployment rates across the country. 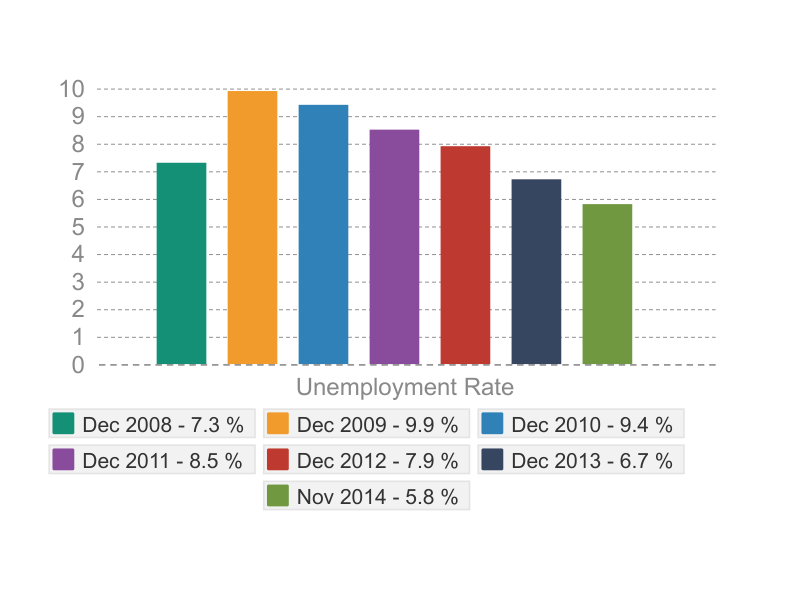 The national average unemployment rate for November stood strong at 5.8 %, the lowest in the last five years. The rates spiked during 2008 and continued fluctuating upwards until the beginning of 2014. The national jobless rates have been falling since Jan 2014, ending on a happy note which stood at 5.8 for November. If the year 2014 belonged to declining unemployment rates, 2015 will be lead by advancing minimum wages gaining momentum across states. The federal minimum wage of $ 7.25 an hour will be challenged by by most of the states in the US. Twenty nine states in the country are set to raise the bar for the working class this January by exceeding the federal min. hourly wage. This brings relief to various classes of daily wage workers, especially the ones in lower income group.To add on, four states – Alaska, Arkansas, Nebraska and South Dakota approved minimum wage increases through ballot measures in the 2014 election. Mid 2014 saw a revolution of sorts in Seattle, WA. Kshama Sawant, a member of the Seattle City Council single handedly fought for securing legislation that mandates a min hourly wage of $15 in the city. Kshama, a social activist of Indian origin was in news internationally for taking up this cause, battling and winning it for the citizens of Seattle. The city council unanimously passed the wage increase making it a law during June 2014. According to US Bureau of Labor Statistics, a little more than 3.3 million people in the country earn min. wage or less. For someone in the lower income group, the increase in hourly earning by a dollar or two surely makes a difference. It will probably help the lower class in buying food or paying up overdue bills. We had provided an early insight in August 2013 on growing unrest among workers in fast food joints. 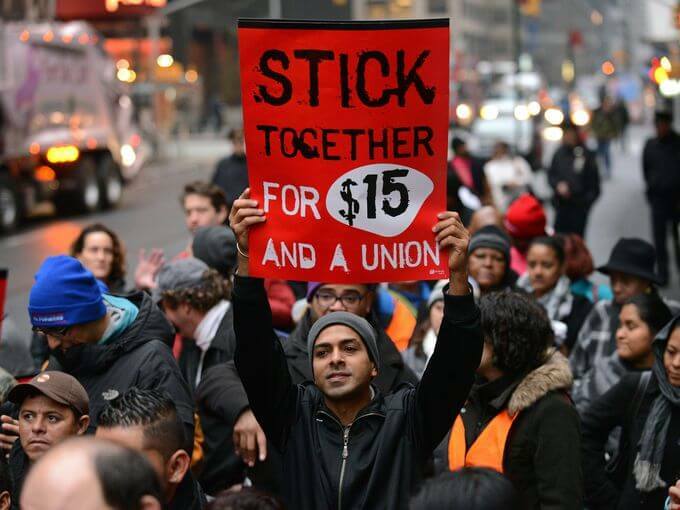 2014 was an year that saw protests by fast food workers gaining momentum. The protests that began in New York after Thanksgiving in 2012 with a couple of hundred protesters has spread like wildfire in more than 33 countries. Their primary demand is hike in hourly wage to $15. For someone like Heather Smith who works at a fast food joint in Atlanta, GA travels close to 12 miles to reach her workplace using public transport, spends a little over $10 towards travelling to the workplace. Says Heather, a sole breadwinner in the family, “ With rising prices and a family to take care of, earning $9 per hour is no good. I have two children and struggling to survive with this kind of income. Even with extra hours at work, I am unable to make ends meet”. She continues ”These fast food companies make millions of dollars everyday because of our hard work and show little concern for the workers. The govt. has to bring in legislation to increase minimum pay”. It appears that 2015 will see sustenance in such protests demanding wage hikes. There may be other classes of workers joining the revolt for fair pay. This year will also see some reforms in wage laws in the country. With the stage set for exciting times ahead, we are only as hopeful as you. Unemmployment.org wishes all our patrons and readers a Happy and Prosperous year. Let 2015 keep you occupied with work and good wages. We encourage you to participate in our community threads and share your experience.